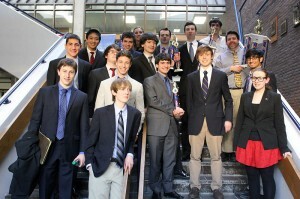 Thirty-five schools and 342 debaters participated in the Connecticut Debate Association’s three January tournaments held in Stamford, Fairfield and Ridgefield on January 11th. All in all, this was a slow weekend compared to recent CDA activity, due largely to mid-terms and colds. Thanks to coaches Ian Lear-Nickum, Mick McGarry and Jeanne Tejada for their hospitality. Resolved: States and municipalities should not provide economic subsidies or incentives to corporations. The final round at King Low Heywood Thomas School in Stamford was won by the New Canaan team of Gita Abhiraman and Abbie Jameson on the Affirmative over the AITE team of Michelle Printsev and Bartek Walas on Negative. The final round at Fairfield Warde High School was won by the Amity team of Eeman Abbasi and Kristin Zakoworotny on Negative over the Fairfield Warde team of Brandon Campbell Sara Murphy on Affirmative. The final round at Ridgefield High School was won by the Wilton team of George Mgaloblishvili and Neel Kaushal on Affirmative over the Joel Barlow team of Brendan O’Connor and Hunter Lightman on Negative. Congratulations to all our trophy winners and 3-0 teams! You may view or download the complete January Results, as well as the resolution package at http://ctdebate.org/CDAJan14.html. Our next tournaments are on February 1 at Glastonbury High School, Greenwich High School and Masuk High School. The invitation should go out on or about January 20. To learn more about debating in Connecticut, visit http://ctdebate.org.